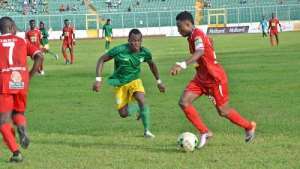 Kumasi Asante Kotoko has defeated Aduana Stars 1-0 to kick off their campaign in the just started Ghana Football Association (GFA) Normalization Committee (NC) Competition. The NC’s Special Competition which is expected to engage the Ghana Premier League and Division 1 League clubs in the absence of a competitive league commenced this weekend with the Porcupine Warriors hosting the Fire Boys from Dormaa. With 3 points as well as bragging rights at stake, it was the Kumasi based side that came out victorious courtesy a goal from Abass Mohammed. CK Akonnor’s men determined to make a statement in the competition, started the match all fired up as they attacked their opponents right from the blast of the whistle. Having scored in as early as the 2nd minute, they could however not find the back of the net again with the match eventually ending 1-0. Aduana, on the other hand, pushed for an equalizer but could not get anything out of the game despite Captain Yahaya Moahamed finding the back of the net. His goal was disallowed with the referee adjudging it to be an offside goal. To make matters worse for the reigning Ghana Premier League Champions, midfielder Noah Martey was sent off after receiving a second yellow card as a result of a bad foul on Emmanuel Gyamfi. The narrow victory for Kotoko means they are well on course to winning the Northern Zone of the NC’s Special Competition to give them the opportunity of returning into continental competition next season. Nonetheless, it is early days yet with the competition expected to get tougher and more intense in the coming weeks.